At the beginning, I designed a work called Headpiece. This would look like the head of a human. I began by creating a 3D CAD drawing of an ancient glass cup (see Fig. 1) on my computer screen. This process enables me to engage with the relic in different angles, levels, and colours (Fig. 2). Throughout these experiments the form of the glass cup revealed its potential to be a piece of jewellery. The 180 degree-rotated shape (Fig. 3) is evocative of a human head with a traditional Korean hairstyle (Fig. 4). This manipulation and combination of viewpoints provides me with a new perception of the objects and offers me a new way of presenting readings of the relics, symbols, and patterns from the three kingdoms. I became able to see unexpected visual elements of relics by looking at different perspectives. I commenced by searching for appropriate symbols to depict eyes and eyebrows, which can characterise the Headpiece to look as if it is a human face. With this in mind, in April 2013, I visited an exhibition, at the Melbourne Museum, Afghanistan: Hidden Treasures from the National Museum, Kabul. 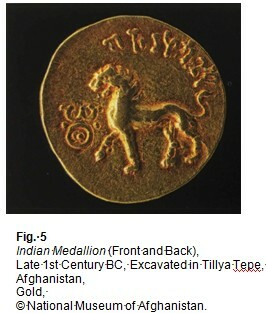 The show presented the treasures of Afghanistan from the 3rd century BC to the 1st century AD, reflecting the beginning of Silk Road culture (Hiebert 2008, p. 57). More than 21,000 individual gold artifacts were found in the six burials excavated at the hill appropriately named ‘Hill of Gold’ (Tillya Tepe) in 1978. When the discovery was first made it was headline news around the world. The elaborate designs of the artifacts tell the story of a sophisticated group of nomads who were an essential part of the Silk Road – in contact with a vast array of people across Asia with goods both from Rome and from China (Hiebert 2008 p. 63). 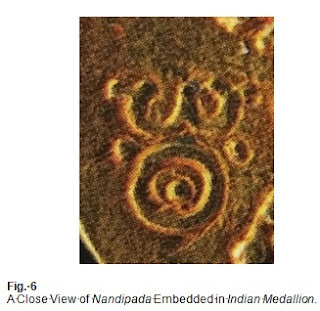 Archaeologist Veronique Schiltz (2008, p. 276) investigated the symbols in the medal and stated: ‘It is possible that we have here the oldest representation of the Buddha, a forerunner of traditional Buddhist iconography.’ This symbol is called nandipada (Fig. 6). Apart from archaeological and semiotic findings, from my perspective, the nandipada looks as if it is a human eye and eyebrow.